One of my favorite dessert recipes to make and eat is Creme Brulee. I love that it is smooth and creamy and the nice toasted sugar brulee on top is always fun to eat. 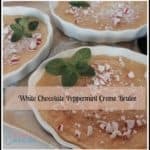 In addition to the Pumpkin Creme Brulee I made, I thought I would go with White Chocolate Peppermint Creme Brulee, one that can be used for the winter holidays. Don’t get me wrong this is not just a holiday dessert, you can make it anytime. Creme Brulee, is simple to make. I only had to purchase a few ingredients because most of them I have in my refrigerator or pantry. I first started by preheating my oven and getting my ramekins ready. This recipe was supposed to make 6 servings, but the new ramekins were a little larger, so it only made four. That is fine for now, because I just tell the family there wasn’t enough and since I don’t want to skip anyone in the family, I have to eat them all myself. (I don’t actually tell them this, they are just gone before they notice). Oops, I am getting off course here. Back to the prep. I get my eggs separated and store the whites in another container so that I can make my favorite buttercream frosting at another time. I set my pan up and make sure the ramekins fit in it and boil some water. Then I start my recipe. Place white chocolate in a double boiler, or in a heatproof bowl set over a pan of simmering water and stir constantly until melted. Remove from heat. Whisk sugar, peppermint, yolks, and cream, blending very well. Strain into a large bowl, skimming off any foam or bubbles. Divide mixture among ramekins. Place in water bath and bake until set around the edges, but still loose in the center, about 40 or 50 minutes. Remove from oven carefully and leave waterbath until cooled. Remove ramekins and place in refrigerator to chill for at least 2 hours up to 2 days. 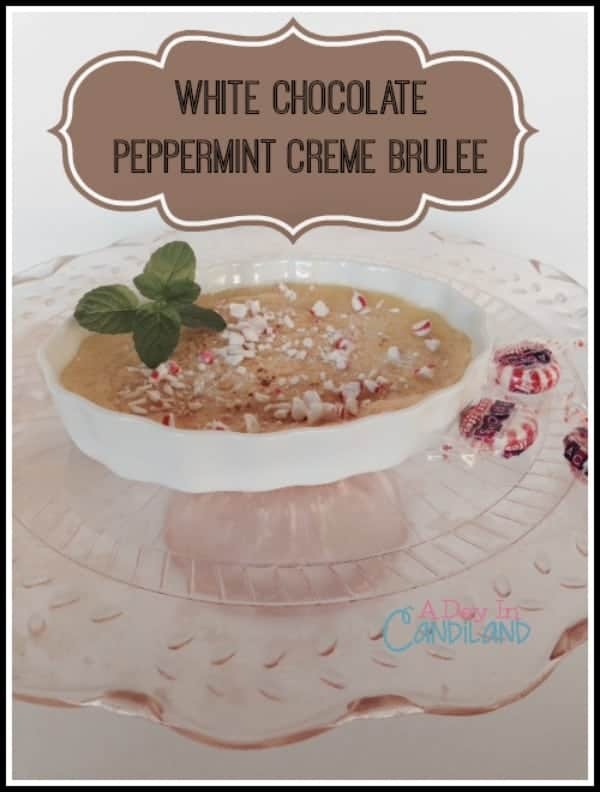 When ready to serve, sprinkle 1 or 2 teaspoons of the crushed peppermint candy evenly over each custard. Use your torch to caramelize the crushed candies. Once done add your garnish and return to chill for an additional 10 minutes. Have you made Creme Brulee before? What is your favorite flavor? You might like these additional desserts to make. My kids kept asking, can I do it. thanks Christine, this was a fun dessert that tastes so good. Holy crap, this sound AMAZING! Definitely pinning this! 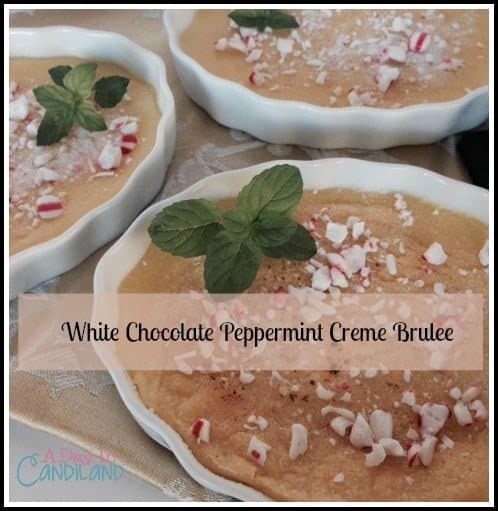 Isn't it a fun dessert so perfect for the holidays. 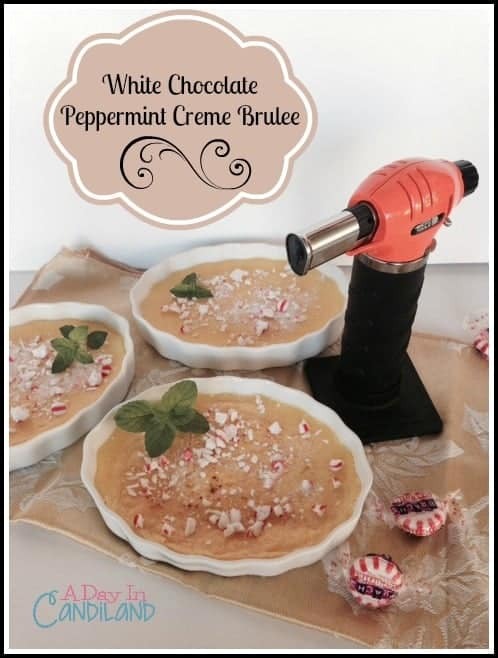 Nice change from the basic creme brulee and will work great with the upcoming holiday season! Thanks Savanah for stopping by the blog. Have a great week. If I had a blowtorch, I would definitely be making this. Thanks for sharing! My son would want to make it just to play with the blowtorch– looks great! Candi, that looks so fabulous! That would be such a great Christmas dessert! So glad you shared it with us at Foodie Fridays!! Pinning! Have a wonderful day! Oh, my! This looks absolutely delicious! Ditto on the blowtorch! My boys would love that! I've never tried to make creme brulee before because to be honest that blow torch thing kind of scares me! I need to try my hand at creme brulee again. I have one of those flame thingies. Looks great! You need to just come make creme brulee FOR me. LOVE it but never take time to make it. Wow this looks so yummy and seems easy to make…yum!! My recent post My Top 6 HOT Toys Christmas Edition! I am not a fan of peppermint, but I know a bunch of people that are. This looks so good! I know, it has to be in just the smallest amount or it can overwhelm.